Winter is just around the corner, dolls and dudes. 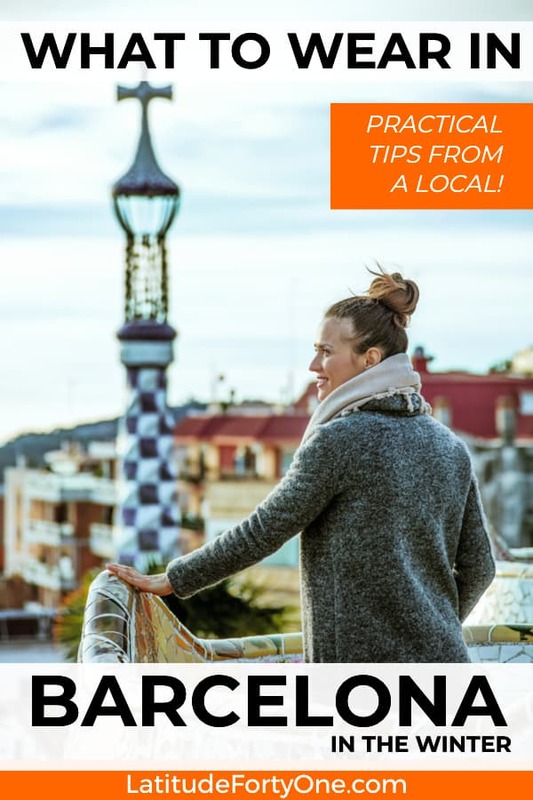 I’m talking about December, January, and February — those cold months when you peruse the Christmas fairs, check out the festive street lights, and hit up the Three Kings’ parade. Or just move around the awesomeness that is Barcelona. And of course you want to dress appropriately — warmly, comfortably, but also fitting into the general fashion panorama. i.e, not being a target for pickpockets. 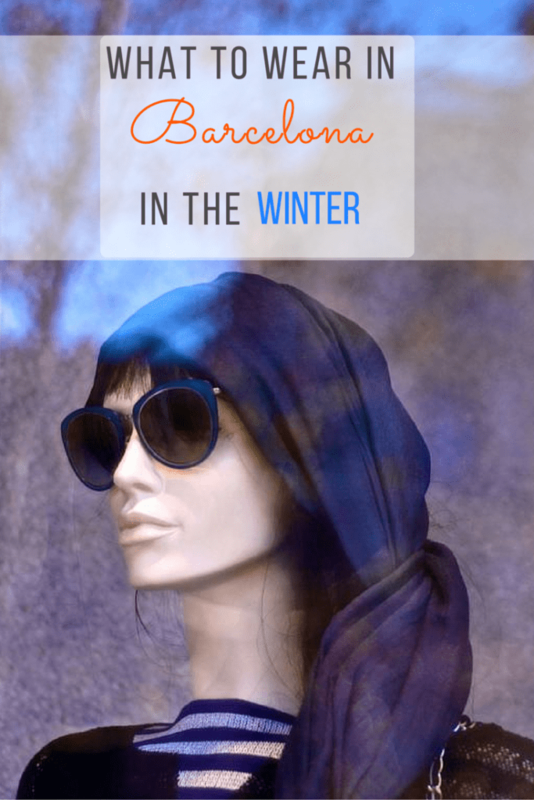 But for the sake of helping those who’ve never been to Barcelona, this is a practical, stylish guide to dressing in Barcelona during the winter. When you have no idea what to wear and you don’t want to stick out as a tourist. Suit to your own tastes! I’d label it smart urban style. Classic but not boring. 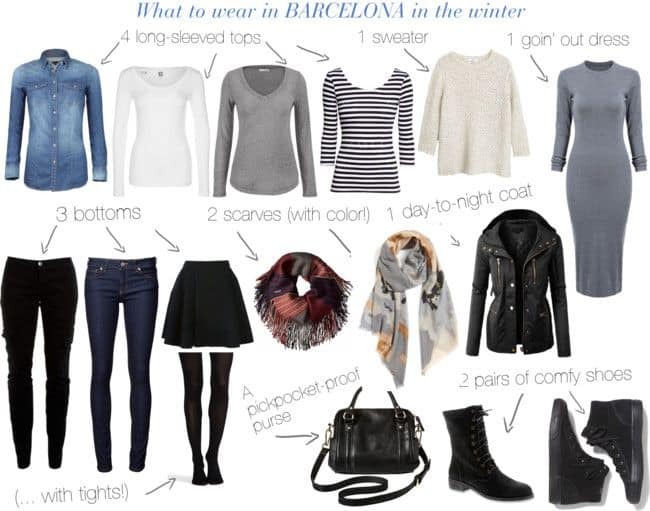 If you’ve seen my post on how to dress in Barcelona according to season, I still stand by my advice of wearing neutrals: grays, browns, blacks, and splashes of white. You can always play with color through your accessories! That’s what I do. I combined comfort and style. 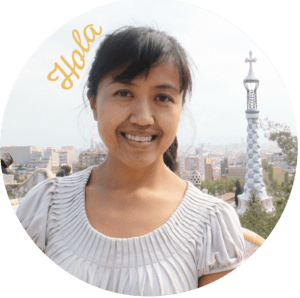 I assumed that you’d be walking a lot around Eixample, through the Raval streets, and down the breezy Barceloneta. I’ve also follow some insightful tips from The Pocket Stylist by Kendall Farr. It balances trends with traditional. The pieces I chose are indispensables that can be mixed and matched easily. The ensemble is for about 10 days, assuming that you won’t be doing any laundry. Each top or bottom would be worn about 2 times. Or more. Just give it the smell test like I do. Psst..if you came from Pinterest, you may have clicked through this image below. It’s from Polyvore which is now a defunct website. This ensemble still stands! Below are some real wardrobe suggestions that you can buy through Amazon!! Keep reading to find out! Four long-sleeved tops. Three neutral colors and one striped top. A striped pattern can be as a basic patterned piece, which are versatile to mix with other patterns. One sweater for extra layering in case it’s really cold. It can also be worn just over a tank top. A warm, fitted dress if you want to wear something a little more dressy at night. Generally, locals don’t get too dressed up in high heels and short skirts unless you’re going to Opium Bar, which is a nightclub mainly for tourists and college kids. Otherwise in bars, goin’ out wear is almost as casual as daywear. Black jeans. Black goes with everything, as they say. Dark wash jeans can be casual and dressy. A black skirt. Sometimes I want to feel a little girly and feminine in a skirt. Plus they’re more comfortable than thick jeans. Lately, I’ve been pairing skirts with thick leggings. And…shhhh…some biker shorts over them in case it catches wind, or I feel like moving around more freely. That’s what I use, and it’s liberating. Medium boots. This fall I’ve been looking around, and I don’t see many people wearing tall boots this season. I love the dressiness of boots, but they must be comfortable. And for me, that means wearing flat ones or having a minimal heel — especially if I’m going to be walking around the city or in any cobblestoned areas in the Gothic Quarter. Cotton tank tops or camisoles (shown later) to go underneath it all. I usually wear two layers of clothing indoors (tank top + blouse), and three outdoors, which includes my coat. They’re seamless! I think I need these. A purse with a long strap so that you can wear it diagonally across your body. If you’ve seen my post on how to not get robbed, I explain it here! Better yet, get an anti-theft purse (see my guide). I have one and I LOVE IT. I have this purse and love love love it. Warm winter tights are a must under the skirt and dress. It’s not cold enough that you have to wear them under trousers or jeans. Two patterned scarves. 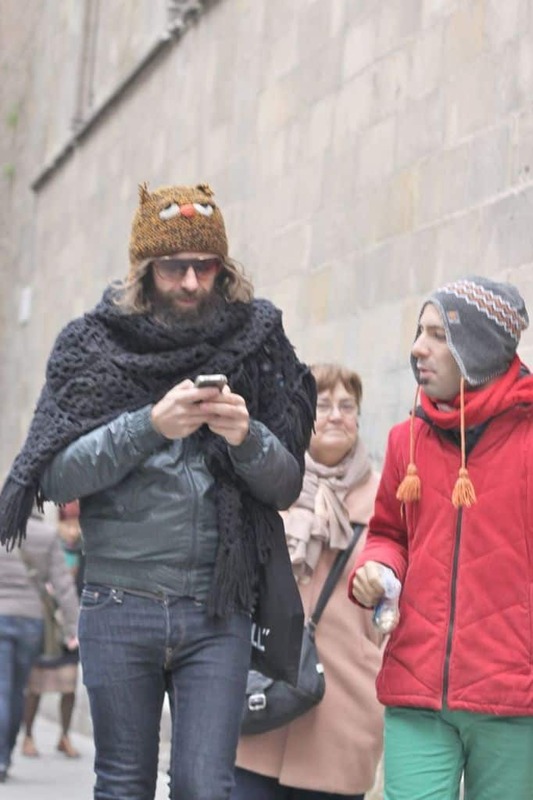 Spanish women love their scarves, and I’ve definitely adopted the style. You’ll see them being sold inexpensively everywhere. You may feel inspired to take a few more home as souvenirs. Casual shoes. Again, if you’re going to be doing lots o’ walking, pick something comfortable. I’ve seen lots of cute New Balance athletic shoes, which would be paired nicely with some jeans. Chuck Taylor makes a cool wedge! 1) Check the weather forecast first (duh, I know). The weather varies. It rains in Barcelona, but no more than a few days at a time at the most. And it doesn’t snow here. I wouldn’t bring rain boots or rain coats. Just make sure your shoes are weatherproof if you’re concerned about water getting in them. And you can always by a cheap umbrella if it does rain. Also, regarding mittens, gloves, hats, and animal-themed beanies. I didn’t wear them at all last year. However, I saw some photos I took on November 30, 2013. (It was a personal photo project I called “Barcelona from the hip”). 2) January and February are the coldest months. 3) Beware of drastic temperature changes when moving around the city. If you’re constantly using the metro, you’ll experience lots of temperature changes. It can be really warm underground, but once you come up at ground level, you get hit by a strong breeze. And like your mama says, “You’ll catch a cold!” Keep yourself warm. I didn’t really know about this, so during my first two years of living here, I kept getting sick. Maybe it’s just me and a few people I know, but you can weigh in here. Of course, don’t forget to pack your toiletries, warm pajamas, pretty undergarments, laptop, camera, selfie stick, and your coziest teddy bear! 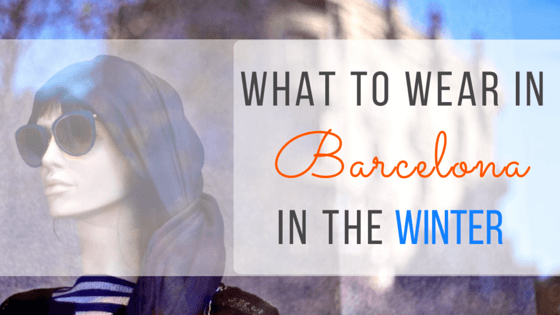 Have you been to Barcelona in the winter? Would you agree with my tips? Do you have any more to add? Thank you so much! Just the kind of advice I was looking for, and it turns out that everything in my suitcase resembles the outfits you put together in your post, so I guess I am well-prepared! Ah, stylish minds think alike. Actually, if you look up what to wear in Paris, I’ve seen similar outfits put together. Because can’t go wrong with black, right? What purse is that? Where can I buy it? Unfortunately it’s not sold anymore. It’s from Target! It was called the Women’s Mini Satchel Faux Leather Handbag with Removable Crossbody Strap. It’s cute, right?